Interneka is a completely hosted software solution that gives new and experienced affiliate managers alike all of the tools they need to develop and grow a successful affiliate marketing program. A ‘hosted solution’ is one that requires no installation on your part – you simply pay your start up fee and monthly subscription and all of the hard work is done by Interneka. As such, there’s no need for extra storage, for in-house maintenance or any other cost centres sometimes associated with this kind of software, making Interneka a great choice if your budget is limited. If this sounds like the sort of software that might help improve your business, read on to find out everything you need to know about Interneka! Interneka offers users a wide range of great features and tools that makes running and managing an affiliate program a little easier. Interneka prides itself on offering managers complete control over affiliate accounts – this means it's easy to make changes, alter commission structures, examine performance and much more. Quite correctly, Interneka points out that this level of control is key to ensuring affiliate performance, with control over your affiliates being akin to control over profits. All major elements of the software can be fully customized to reflect the particular nature of your affiliate program, including pricing structures (PPC/PPL/PPS are all available, among others), commission levels, commission tiers and more. All in all, more than 50 features combined give you all the control you need to boost sales and revenues and make your affiliate program grow. A few other features we found at Interneka deserve a mention here. The software is multi-currency supportive and also permits affiliate managers to make payments to their affiliates using a wide range of online payment tools. The software is also easily integrated with any type of shopping cart, merchant, billing and payment software, making it easy to seamlessly combine Interneka with your existing operations. Finally, real time reporting and analytics tracks presents and displays the most up-to-date information about performance – helping you make key decisions based on the most relevant data. Interneka is offered to customers as part of three different packages. Customers can choose from either standard or advanced packages, priced at $29/month and $39/month respectively (both come with additional installation charges, see above) or opt for the licensed solution (that does not have a monthly subscription charge) for $799. All of these solutions are hosted and come with a vast array of inclusive features, so you can be sure that you will be able to see a great return on your investment at a very reasonable cost. What’s more, unlike other services, there are no hidden network charges or add-ons to purchase – everything you need comes with the software! All in all, while Interneka doesn’t quite have the features or market popularity to make it higher up our rankings in this category, we were pretty impressed by what’s on offer here. 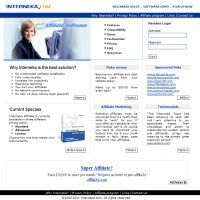 If you’re looking for a flexible, affordable affiliate management solution, Interneka is a great choice.